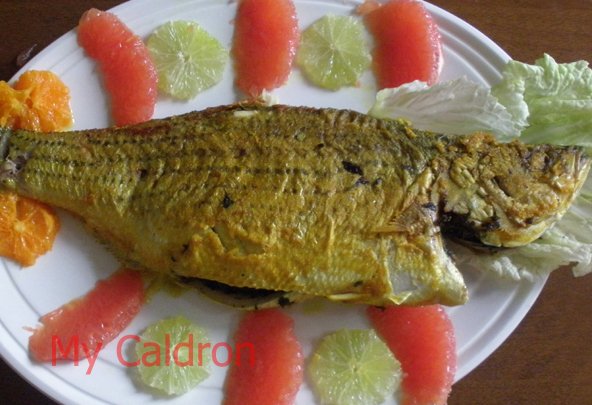 Fried stuffed whole fish is another ‘region-specific’ type of Persian cuisine which I relate to so strongly because my parents were originally from that region – Bushehr. Even as a child I used to love this dish and I remember so vividly each time we had it for lunch I had to bother somebody sitting next to me to rid my portion of fish bones for me before I could attack my plate. I still prepare and cook stuffed fish my mom used to. Replacing the pretty, slender, round-bodied raashgoo and shurideh (two types of Persian Gulf fishes) with Sea bass does not seem to matter anymore; I still enjoy this dish enormously. Hope you do too.